Sample Codeplugs for the Baofeng RD-5R. 40 metre Horizontal Loop Antenna. Is it possible to extend the 40m Sky Loop to cover 60 metres? An experimental project. HF whip antenna carrying tube for less than €10. IC-7300 Review and operating tips. IC-7300 connectivity to an external (non-ICOM) power amplifier. SOTA Backpacks – what to take? SOTA Creation and tests of new RHM8B/tripod antenna set up. DD5LP/P – February 5th. 2016 – 5 Summits in a day. The 10m/6m challenge finishes on February 13th. 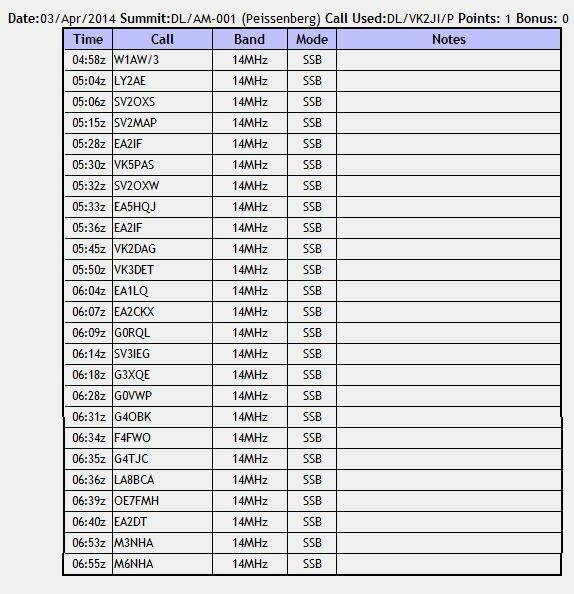 2016 and I wanted to pack in some more 10m summit activations before it ended. Without travelling to a different country (e.g. Austria), an activation on 6m is not possible as portable 6m operation is illegal in Germany. I have already tried going to two Austrian summits and was unable to get even one 6m contact on either of them, so I decided to look at any local summits where I have not been able to get a 10m contact from during either of the two halves of the challenge. 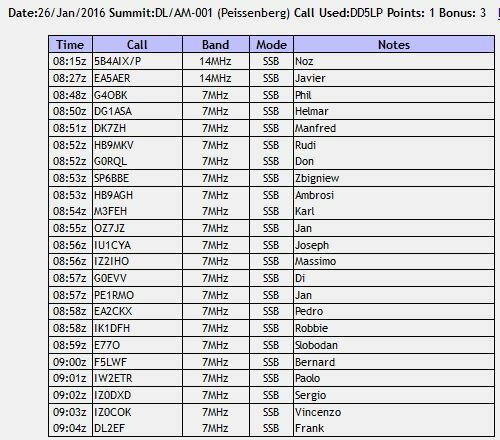 I activated DL/AM-001 Peissenberg on January 26th, again with no 10m contacts, so I wanted to try that summit again – it is also one of the closest and easiest summits for me to get to. As propagation on 10 metres was absolutely horrible, I alerted the local amateurs to my activation plans in the hope that I could at least manage one ground wave / line of sight contact on 10m. 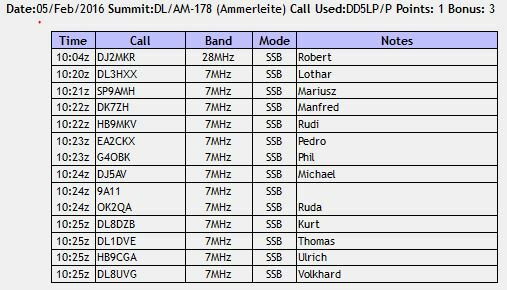 The other local summits that I had not activated on 10m in the challenge period so far, were DL/AM-178 Ammerleite (tried in December again without success), DL/AM-177 Kirnberg, DL/AL-169 Auerberg and DL/AL-179 Weichberg. Making five summits in all – with the drives between these summits and the walking times from where I will be parking my car, this will take a complete day. With mixed weather, there was the real possibility that one or more of the summits may not be accessible. In this case I would try to activate it/them the following week. 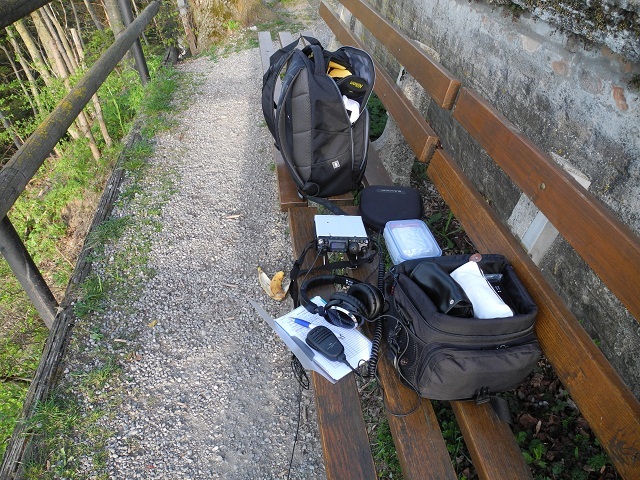 As some of the summits required a fair walk, I took the small radio kit, but also packed the larger kit in the car in case I decided I needed it. About 45 minutes from home and a logical first summit for the loop of activations. This summit I last activated on January 26th 2016, and hence would not gain any activator or activator bonus points, but perhaps a 10m contact. About 30 minutes drive from Peissenberg but then with a 20 minute climb to the summit.This summit I last activated on December 31st 2015 and hence would be able to gain both activator and winter bonus points along with another 10m summit point if all went well. About 20 minutes drive from Böbing where I park the car for Ammerleite. I have not activated this summit this year so as well as the hoped for 10m multiplier point in the challenge, I should be able to get the summit activator point as well as the 3 winter bonus points. The trip over into the Allgäu region takes a while from Kirnberg, around 45-50 minutes. Like Kirnberg as I have not activated this summit this year as well as the hoped for 10m multiplier point in the challenge, I should be able to get two summit activator points as well as the 3 winter bonus points. Just up the road from Auerberg, this is the shortest drive between the summits about 15-20 minutes and again I have not activated this summit this year so as well as the hoped for 10m multiplier point in the challenge, I should be able to get the one summit activator point as well as the 3 winter bonus points if all goes well. So there’s the plan – 5 summits, all of which I have activated before and hence know the best approach to each of them. A possibility of earning 5 10m challenge summit multiplier points, 5 activator points and 12 winter bonus points. The planned day was on and then off a couple of times as the weather forecast kept changing. Friday the 5th. of February I set off expecting some rain showers but nothing much and that the snow would have gone from most of the summits. This turned out not to be true. The rain never came, but the snow was still there at all summits making access to Ammerleite, Kirnberg and Weichberg particularly difficult when climbing through snow drifts and sliding on wet, slushy ground. Peissenberg, the first summit turned out to be horribly cold and after getting just one contact with Robert DJ2MKR (a local station to me here) on 10m using the loaded vertical on a tripod, I packed up while I still had some feeling in my fingers. If the weather was to stay as cold as this, it was going to be a difficult day! I also was not happy with the SWR from the vertical and so decided to use the usual 5m fibreglass pole and Spiderbeams OCF antenna on all following summits, even taking the 40m/20m amplifier and its batteries with me as well (but never using it). The next summit was Ammerleite or rather Schnalz as the actual summit is called. I used the longer (official) access route following the closure of the road to the easier access point last year. After parking I picked up the two bags that contain the larger radio configuration and set off up the track. This is quite a steep ascent up a forestry track which in parts was like a river and in other parts very slippery. The final approach to the summit is across two fields which were still partly covered by snow drifts, making the ascent “interesting” as I was certainly the first person up this “track” since the snow had fallen. Once on the summit, setting up took a little longer than normal, this time not because of the cold but rather because of high winds. In any case once set-up, I was able again to get a contact with Robert on 10 metres (but with no one else). I then changed to the zoo that is 40m and made another 13 contacts before packing up. Although the short activation at Peissenberg had put me ahead of schedule the extra ascent time through the snow to Ammerleite had lost that time and I knew I would have to take the descent slower than I would like, so I was concerned not to lose any more time. Once I was back at the car and had warmed up a little, I checked my route to Kirnberg and set off, eating a sandwich en-route. The distance from the parking spot to the summit at Kirnberg is not far but again, it was made difficult by the still laying snow as was the erection of the dipole antenna when I reached the summit. While Peissenberg had been very cold and Ammerleite very windy, Kirnberg turned out to be both very cold and very windy, with the result that I was eager to get the activation done and get on with the long drive over to Auerberg as soon as I could. Once again Robert on 10m was the first in the log but despite several calls I was unable to find anyone else on 10m. Rather than the zoo on 40m, I decided to try 20m this time to pick up the needed extra 3 contacts. In fact I got 8 more contacts before the chasers ran out, so I packed up again and slid my way back down to the car. The trip from Kirnberg to Auerberg took a little longer than planned as I missed a turn off and only when I realised this when I saw I was approaching a different SOTA summit (DL/AL-170 Zweisselberg). So I had to turn around and back-track until I found a way through to the road that I should have been on. I had hoped that the Panorama Restaurant at Auerberg may have been open, so I could have got a warm drink, but unfortunately it wasn’t. It’s probably not worth them opening except at weekends at this time of year. Once I was set up behind the church on the summit, reliable Robert was there again on 10m for me but this time I also managed a contact with Michael DJ5AV near Lake Constance on 10m aswell. I saw that there were a few other activators on while I was at Auerberg and managed an S2S contact with Hans DL/PA3FYG/P but with the other three activators I called, I simply could not get through the pile-ups to them with just my 5w (with cold fingers, I didn’t try to install the amplifier to give me 25w instead of 5w and even with that boost I may not have been able to “break the pile-up”). I worked a total of 25 other 40m contacts from Auerberg in about 50 minutes. At this point, I was running behind schedule, so it was time to shut down and pack up again and see if indeed I could manage all 5 planned summits in the day and get home at a reasonable time. Auerberg to Weichberg was probably the shortest drive of the day at about 15 minutes. The parking spot for Weichberg is not normally a long walk from the summit, but in this case no one had used the track up the hillside and I had to “break the track” through the snow to mark the way up to the chapel on the summit. The 4 or 5 people who came up while I was operating probably appreciated my marking the track – on the way down it was a lot clearer and easier to negotiate as it had been used more. Weichberg would have been a good summit to use the vertical on a tripod from as there is only limited places to install the fibreglass squidpole but as I had left the vertical in the car, I was not going to go down to get it and so the dipole went up as best it could. 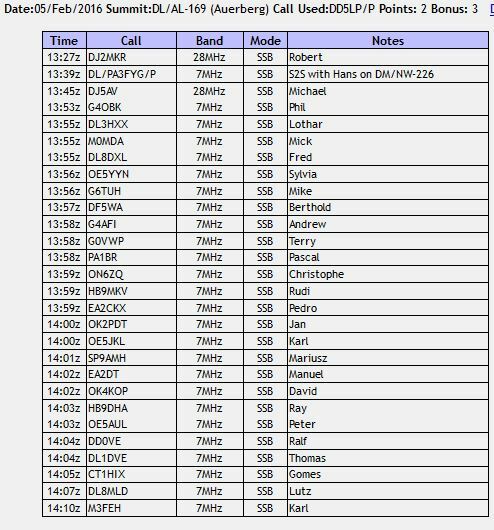 One call on 10m and there was Robert, reporting this was the weakest he had heard me but I still broke over the top of some S5-S7 noise he was having on 10m from some local installation. Apart from Robert, I worked a further 7 stations on 20m, with some weak reports. It was only after getting home that I realised that the FT-817 had switched down to 2.5w output from its maximum 5w due to the battery voltage dropping. I had a spare (charged) battery with me however on Weichberg, I just wanted to bag as many chasers as could hear me and then pack up and head home to a warm bath tub! So it was after 25 minutes of operating on Weichberg, I packed up for a last time, happy with the fact that I had managed to activate all 5 summits but glad it was over. The state of the paths and the fact that there was still quite a lot of snow around had surprised me as all snow at home had gone some days before. Spiderbeam Aerial-51 UL-404 off centre fed dipole on 5 metre squid pole (all other locations). At this time of year, fives summits in one day is probably the most I could have achieved. 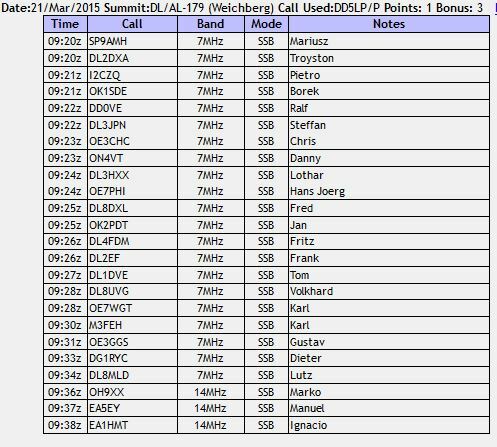 In summer 7 may be possible as I drove past one summit (Rentschen) which I had already activated on 10m and activated this year and so would get no points for it and the DL/AL-170 Zweisselberg summit that I almost reached by mistake would probably also be a possible seventh candidate! 73 ’til the next summit! ….. or summits? DD5LP/P – January 26th. 2016 – DL/AM-001 Peissenberg. January 26th. is Australia Day. One of the three days in the year when VK stations can change their calls to start with AX rather than VK (the other two days are Anzac day and International telecommunications day). As John VK6NU had said he would be out late enough VK-Time (late afternoon) to hopefully catch some long-path contacts into Europe, I decided to go out to a local summit (early morning here in Germany) to try for an S2S contact back to Australia. I managed to complete the move of my Ramsey QAMP from it’s flimsey plastic case into a die-cast aluminium case the day before and testing it, it actually still worked apart from the fact that the power LED that I had added didn’t light up (swapped its leads around and even that then worked!). I had made contacts both to chasers and activators via long path from DL/AM-001 before, but not at this time of year. In any case, if you don’t try you’ll never know. I also hoped to get some 10 metre contacts for the current challenge as no one has activated this summit on 10m before. Peissenberg is a drive-up summit with about 300 metres from the car park to walk to my comfortable operating position. I have been to the summit on several occasions before so I needed no map to find it. The views are fantastic, especially early morning and with the luxury of toilets on-site this would be an ideal summit for someone new to SOTA to have as their first summit activation. In my case it’s one of a few summits that are less than an hours drive away from home and as such suitable for early morning activations. After a non-eventful drive down, I started to set-up my gear on the usual bench and strapped the 5m fibreglass mast to the railings as normal using “Bongo-ties” (these are great things – rubber bands with a small wooden toggle on them (that looks like a miniature bongo drum, hence the name)) so that you simply wrap them around objects and clip the ends back into each other. You can of course tie two together to get extra length, which I have done. While sorting out the rig and log book I suddenly saw the mast tipping over as one of the ties had released itself and fired off down the mountain, never to be seen again. I normally have a spare with me but could not find it, so I then had to re-arrange the base of the mast so that it would be held sufficiently well with just one double bongo-tie. With that problem sorted I started to unwind the dipole sides and the small spool that I use to wind the wires on fell apart and in the process knotted up the wire and cord. This of course took a little while to untangle sufficiently for me to be able to install the antenna. The day was not starting well and all of this in under zero degrees temperatures my fingers were already feeling frozen. Despite these couple of problems, I got on air at my alerted time and started putting out a CQ on 10 metres and self-spotted. Nothing! I tried for 15 minutes, still nothing, so I moved to 20m put the amp in circuit and started calling there – again no replies. I wondered if the antenna was simply not working, but the SWR looked OK. I tuned around and found a Swedish station activating a WWFF park, so gave him a call, got through and got a report – so I was getting out! Some more tries and spotting on both 10m and 20m resulted in one chaser call on 20m. I then saw the spot for John VK6NU in Australia but couldn’t hear a thing from him. The conditions on both 20m and 10m were horrible. 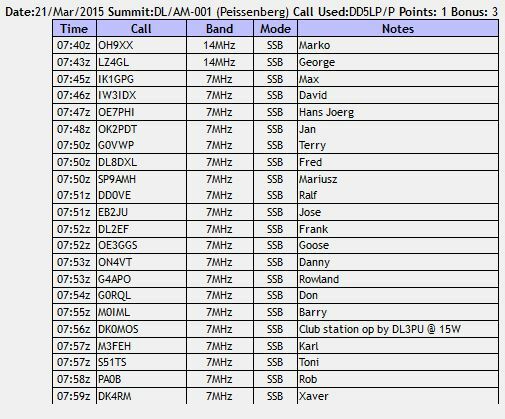 So in order to at least qualify the summit, I moved to 40m and the difference was immediate – pile-ups despite the fact that Peissenberg is only a 1 point summit, it seemed the whole world (or at least all of Europe) wanted a contact with it! So at the end of the day a successful normal activation, unfortunately with no VK or 10m contacts though. Better luck next time? At least the QAMP worked without issues in the field! Spiderbeam Aerial-51 UL-404 off centre fed dipole. Unlucky with the 10m and 20m band conditions (10m improved later in the day). January is not the month to try for Long Path SSB contacts into VK. 73 ’til the next Summit! DD5LP – March 21st. 2015 – DL/AM-001 Pießenberg & DL/AL-179 Weichberg. In the hope of bagging a couple of VK contacts and taking advantage of the fact that most of the snow had cleared, I planned these two activation of 1 point summits before the end of their winter bonus period. After the previous problems with activating Burndorfer Buchet a couple of weeks earlier (this is a simple, no winter bonus, summit) becuase of a fully iced over track, I was hoping not to meet similar conditions on Auerberg and Weichberg. These activations would have to be strictly time controlled as I had to be back home for an appointment at noon. I have already activated these summits a couple of times. They are easy to access, with just the last section needing to be walked in. For fuller detail on the summits and access, please check my reports on this website from last years activations. I’m glad to report no snow or ice related issues in getting to Peißenberg. The traffic was heavier than expected however I still arrived and set-up ahead of my planned activation time. I started on 20m hoping for long path into VK as I had managed from Peißenberg before, but no luck. Even other European summits that had been spotted, I could not hear. I spotted myself and started calling. It took a little while but I managed two contacts into Finland and Bulgaria with good signals in both directions. When I switched to 40m however, it was a completely different story. A “wall of noise” of chasers that went on for a solid 15 minutes, by which time, with my tight schedule, I had to pack up in any case to move on to Weichberg. On arriving at Weichberg, the access track was a little muddy but apart from that no ice or snow problems. I tried to quickly set-up however I was joined by some inquisitive walkers, an 85 year old with his 80 year old wife, so once I had explained what Amateur Radio is about, I was getting to my planned activation time before I finally go on. Given my experience on Peißenberg, I decided to start on 40m and again ran straight into a pile up that lasted again 15 minutes. I then decided to try 20m quickly before packing up. Conditions on 20m were no better than earlier and I only managed 3 contacts on 20m this time.Marko from Finland again and two Spanish stations. So it was only a matter of untangling the antenna after taking it down and packing up as quickly as I could with frozen fingers (yes it was still very cold on both of these summits) and then head home and out to my appointment, which I “just” made on time. Aerial-51 model 404-UL asymmetric dipole. Ramsey QAMP, modified to cover 40m & 20m. Propagation is a fickle partner, especially a couple of days after a major CME has hit the earths atmosphere, one should always be prepared for more than one band. The Aerial-51 is fast becoming my “go to” antenna for SOTA operations replacing the SOTABeams linked dipole as it appears to perform just as well but it is a multi-band antenna that doesn’t need to be taken down to change bands. The Ramsey amplifier also now appears to be operating reliably, it’s a shame that it only gives me 15W output on 20m (25W on 40m is a nice level). This is probably due to the design running the transistors under their preffered voltage. Try not to plan SOTA activations into a tight schedule. I was lucky this time, but it could have been that a delay on the summit could have caused me to be late for my appointment. This activation was planned to coincide with the activations in VK2 that were to celebrate 1 year of the VK2 SOTA Association. As an added bonus a new Australian association VK6-Western Austrlia was launched on September 1st. 2014. To avoid any risk and to be active when the long path conditions are open from Europe to Australia (early morning), I decided to activate Peissenbeg for a second time this year, despite the fact that I would receive no activator points. A couple of activations ago my Ramsey QAMP stopped working, so before this activation I wanted to see if I could repair it. As it turned out, one of the two power MOSFETs in the small amp had failed and when I replaced it with a spare that I luckily had, the amp worked better than before. It appears that the two MOSFETs need to have very similar charactistics, possibly because there is only one bias transistor for both MOSFETs. Peissenberg is an easy access summit which given the early start (7am local time) was welcome. The trip down took just over 40 minutes, about 10 minutes longer than from my old QTH. The sun had just risen (with a very red sky, warning of storms later in the day that actually never came!). 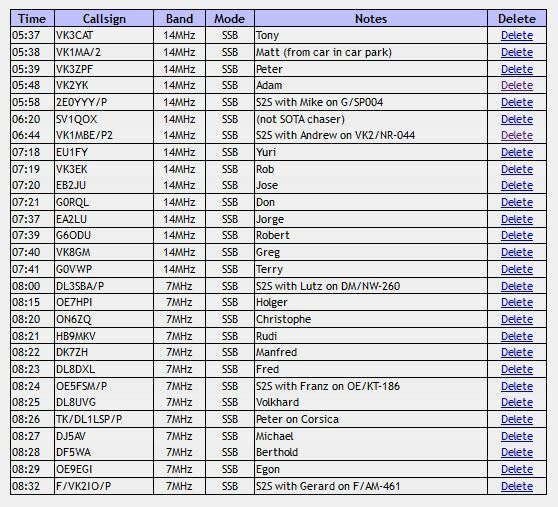 On tuning around 20m it was clear that finding a free frequency was going to be difficult with multiple contests under way. I invited Martin DF3MC along to the activation as one thing he had not yet achieved in SOTA is an S2S with Australia. He volunteered his FT857 to give us a little more power and we used my 6m mast and linked dipole. Not only did Martin manage an S2S with Australia, he managed two – one on SSB and one on CW. Conditions varied somewhat over the time we were there. As Martin needed to continue on to Munich, I completed the last hour of the activation using my FT817 and Ramsey QAMP and am glad to report all went well. The amp worked as it should, bringing me some more S2S contacts on 20m and 40m as well and many more chaser contacts. Self spotting from Peissenberg is no problem with good cell phone coverage but initially we took a look around for activators to call, then I handed over to Martin to put out some calls on CW which were relatively effective. We alternated between Martin on CW and myself on SSB during the activation, which worked well. Setting up two stations in the limited area would have made no sense and it meant that Martin and I were able to take some photos and a videos when not operating (my video included below). While the radio equipment all worked well, my camera did not. On turning it on, it did nothing. I tried a few times and then concluded that the battery must be flat and as I carry a replacement, charged, camera battery I swopped over. On turning the camera on with the new battery the camera started up but without my realising, it had done a factory reset in the process. I also appear to have had the video running for a long time without knowing it! Hence the audio is fine but the pictures leave a little to be desired! All in all, this was a successful and enjoyable activation with 28 contacts for me including 5 S2S contacts. With the variable conditons we missed some VK2 activators and unfortunately there was no VK6 activator out on this Saturday (one was out on Sunday). I should have checcked the direction of the dipole. Although not so critical being in Inverted-V form at a low height for maximum effect I would have liked to have it run from NE to SW to radiate off its side NW for the long path to Australia. In fact it was running east-west and so radiating roughly north / south, in fact with the church right behind us it would be absorbing most of the RF in the direction of Australia. Now that I have moved back to Europe from Australia, I did not want to lose contact with my friends in Australia, especially those involved with SOTA. My main station is still en-route from Australia however I carried my SOTA kit with me on the plane, so I have at least some equipment available to try to get contacts back to VK-land. I am presently in rented accommodation, so setting up antennas here could be an issue, so why not from a summit. Rod VK2LAX and I planned this first 2014 European SOTA activation for me, but I was confused with the correct time as based on the times I know we have had good contacts into Germany from New South Wales, Australia, was around dusk & sunset in Australia and I thought dawn in Germany. But this simply does not tie up with the Grey Line map – according to that at dawn in Germany, contacts should be possible into the US but not into VK. I later got confirmation of my suspicions that the contacts EU-VK were long path not the short-path indicated by the grey-line prediction websites. In any case, Rod and I decided to “give it a go”. Given that dawn in Bavaria is at 7am local (UTC 05:00) currently, I was up at 5am to be able to get ready, drive the 45 minute journey, walk to the peak and set-up before sunrise. I was on the air at 04:45 UTC, it was still VERY cold and there were very few stations around on 20m. I wondered whether my rig was working or whether some damage had occurred in transit. Then I heard W1AW/3 in Pennsylvania USA, gave him a call – he got part of my complex call sign (DL/VK2JI/P) but then went back to another station. A second attempt about 10 minutes later “bagged” this special call and more importantly proved the FT817 (5w SSB running from the internal LIPO battery) and the SOTABeams linked inverted-V dipole was indeed still working. Actually working very well. The first 45minutes of operation was patchy with contacts being spaced out quite a lot but as I crossed 05:30 UTC things got a lot better with contacts around Europe and Scandinavia as well as contacts back into VK2, 3 & 5. As 9am local (UTC 0700) approached activities died down again and after putting out a couple of CQs with no response a couple of UK stations called to keep me company. Thinking that conditions had died and since more walkers were appearing at the summit, I decided to close down and pack up. I later found that this had just been a dip in conditions and the following hour would have been better than the previous one. This appears to show that hours 1-3 after sunrise appear to be the best time for long distance contacts, so my next activation will be planned for 06:00-08:00 UTC rather than 05:00 – 07:00 UTC. 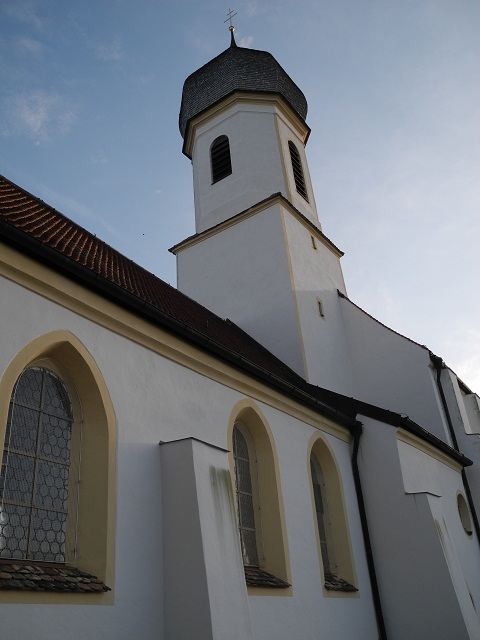 Here are some photos of this beautiful summit, like many summits in Bavaria, a Barock style church has been built on the summit. DL/VK2JI/P station set-up on handy benches. 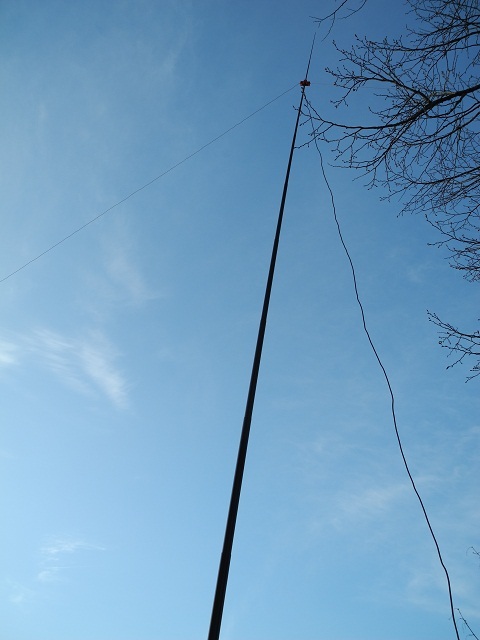 The 20m Inverted-V antenna atop the 6m “squiddy””. 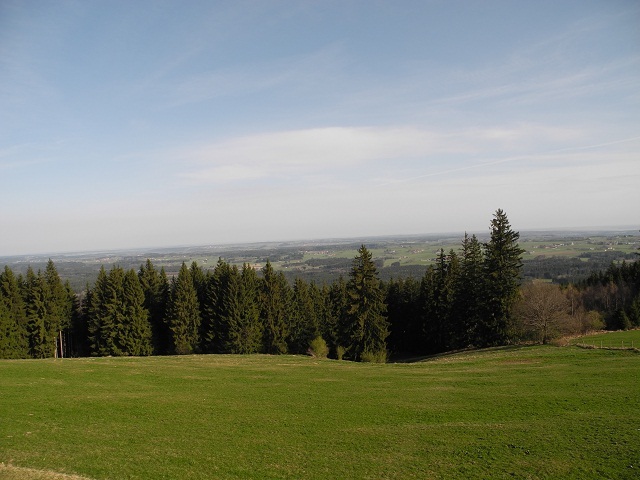 View from Peissesnberg to the South. 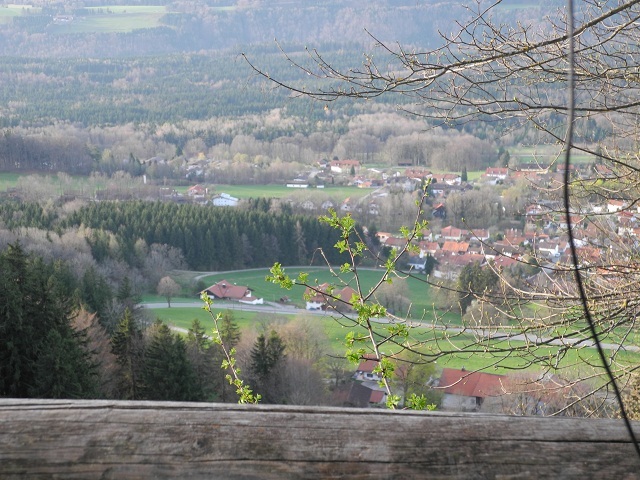 View from Peissesnberg to the North. Search activation reports. Enter SOTA reference or summit name.